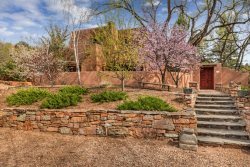 Located in the exclusive Plaza Chamisal compound two blocks from Canyon Road and just around the corner from the quaint Downtown Subscriptions coffee shop and Garcia Street bookstore, Casa Segundo is an elegant vacation rental in the heart of Santa Fe. The master bedroom has a king size bed, kiva fireplace and a luxury bathroom suite with a jetted bathtub, standup glass-enclosed shower, twin sinks and a walk in closet. The master and guest bedrooms are separated by a functional work space perfect for checking emails on the wireless internet or sending a facsimile. The guest bedroom offers two twin beds (which also functions as a king size bed upon request), a kiva fireplace and has a guest bathroom en suite equipped with a jetted tub and stand up shower with twin sinks. The chic, Santa Fe-style interior was designed by the owners and local interior designers Jeff Fenton and Chris Martinez. The open layout of the gourmet kitchen, dining area and living room is ideal for entertaining or just relaxing. An outdoor covered portal also has a kiva fireplace as well as a sitting and dining areas, perfect for enjoying outdoor living. Casas de Santa Fe manages several units in the Acequia Compound which can be rented together for larger parties. These homes include: Casa de Madre, Casa de Amor, Casa Segunda, Casa de Portal, and Casa Chamisal. Love Casas de Santa Fe! We have never been disappointed and the homes have always exceeded our expectations! As always working with you was a pleasure....your team is professional, personable, knowledgeable and cooperative. The property was wonderful. We enjoyed our stay from beginning to end and would recommend you and the properties that you manage to anyone interested in an easy luxurious way to stay in Santa Fe. Perfect! !Your services are extraordinary in every regard and the property was impeccable, as accurately featured on your web site. Can't wait to return. Thanks for everything.